Debra Hamilton (far left) and Deedra McClearn (by her side) pose with participants in DukeEngage-Costa Rica. Just before the summer of 2018 — their second summer with the program — DukeEngage-Costa Rica Program Directors, Deedra McClearn and Debra Hamilton, shared their thoughts on the program, the community, the students’ work, and the incredible cuisine. Why did you decide to get involved with DukeEngage? Debra: As a graduate of the Nicholas School of the Environment, it is a dream come true to work with DukeEngage. My education from Duke was first-rate and I find the same level of integrity with the DukeEngage program. 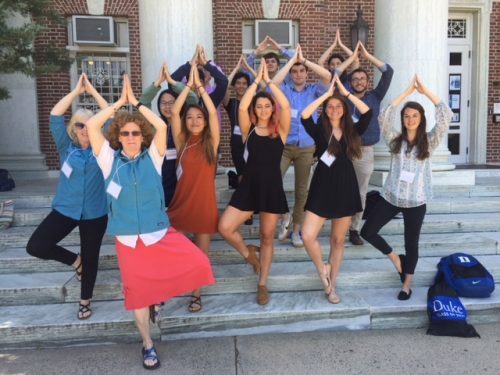 DukeEngage is a contributor to world-wide improvement through its placement of dedicated students who support social and environmental endeavors that strive to advance our level of global cooperation, understanding, and care. Deedra: Over my years at Duke, I had admired the DukeEngage mission and the leadership of Eric Mlyn. We had even talked once or twice about proposing a Costa Rica program. 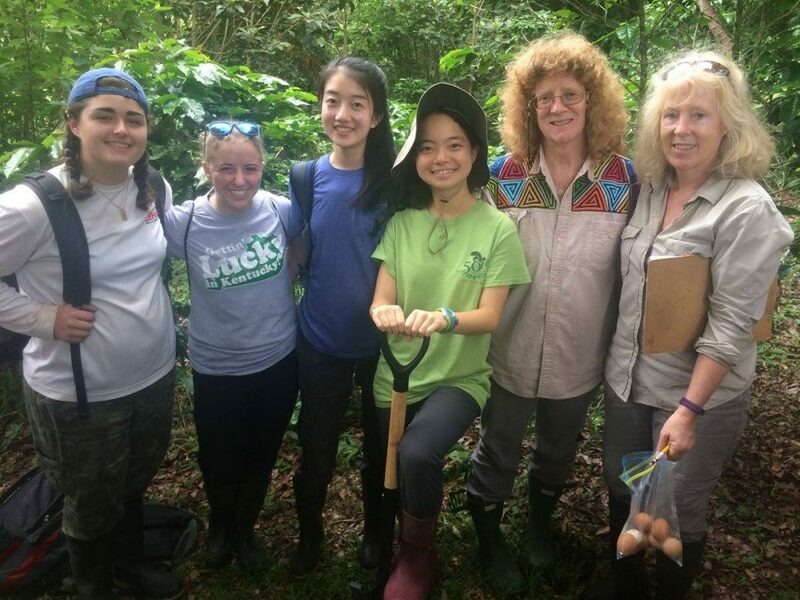 Debra Hamilton, the director of the Monteverde Institute and a key player in the Bellbird Biological Corridor (BBC), is the perfect person to coordinate this DukeEngage effort in Costa Rica. So my interest was in connecting one amazing program/person (DukeEngage/Eric) with another amazing program/person (Reforestation in the BBC/Deb). DukeEngage-Costa Rica participants and group leaders posing for a photo where half of the group’s feet must be off the ground. What do you feel makes your program unique? Debra: Our conservation and research program implements solutions to environmental issues of the region and then assesses the results of those actions to test their merit. Students plant trees in our reforestation program and then assess previously planted areas for their integrity as functioning forests. Based on those results, our reforestation efforts can be improved. The unique component is that students work at both ends of the conservation spectrum while learning about field methods, community involvement, and conservation applications. Deedra: The Costa Rica program is simultaneously international and local, small-scale and large-scale, and of practical and overarching theoretical importance. The Bellbird Biological Corridor and the sponsoring community organizations have more than a 30-year history. The BBC is a component of the international Mesoamerican Biological Corridor. But every tree that is planted is on a particular parcel of land that belongs to a particular person/family/community group. Each tree has been grown from a seed collected in nearby forest and most are tagged and monitored for growth and survivorship. A group of students can come for a day or two, plant trees, and have a meaningful experience. And in 15 years, another group of students can measure those trees and contribute the data to the long-term study of reforestation in this zone. This particular program is one of a very small number of science-based, long-term tropical reforestation programs in the world. What draws you to the focus of this program? Debra: Habitat restoration and research are my passions, especially after studying birds in the tropics and learning of their challenges for survival. I also embrace the interest imparted by the residents who restore their lands to tropical forests. Deedra: I have been working on conservation programs in Costa Rica for the past 20 years. This program on reforesting the Bellbird Biological Corridor is appealing to me because it is practical (planting trees), community-based (planting trees where they are wanted and needed), successful (many thousands of trees planted), and science-based (native trees germinated, planted, and monitored). And now, because of the scale of the project, larger goals can be met, including habitat connectivity, watershed and water source protection, and the involvement of new generations of students and community members. What is your favorite part about the community within the program? Debra: The Monteverde community is very special in that there are many active participants in conservation, academics, art, music, health, spirituality. There are many interesting activities and projects that welcome participation. There is a transient component that provides input from all walks of life and enriches our lives. 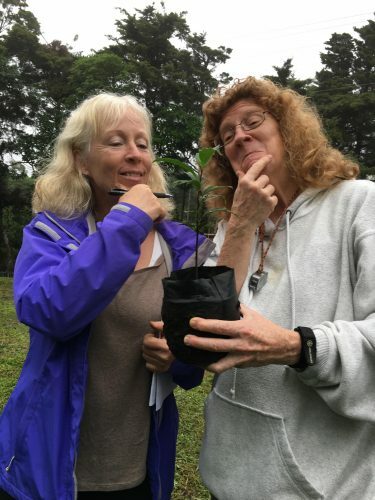 Debra Hamilton (left) and Deedra McClearn (right) having fun with their “adopted” tree species for the summer of 2017. What is the first thing you do when you arrive in Monteverde, Costa Rica? Debra: I walk in the forest where I am surrounded by green and the sounds of birds. Deedra: I check into my favorite hotel (Hotel Bougainvillea) in Santo Domingo and relax in the garden for a day or two to prepare for the work to come. When I lived in Costa Rica for seven years at a biological field station in the Caribbean lowlands, I used to go to this particular hotel every month or so for R&R. So I know the owner, the staff, the gardens, etc. I walk around the gardens, review my plants, do some bird-watching, swim in the pool. It’s amazing. What is your favorite Costa Rican meal? Debra: Personally, I love gallo pinto, the traditional breakfast of rice and beans, with fried platanos, fresh tomatoes, avocado and eggs. Deedra: It depends on where I am. In the lowlands, rice and beans and chicken is fine. In the high mountains, I love the root vegetable soups. In San Jose, I like seafood and international restaurants. One of my favorite restaurants in Costa Rica is a Turkish restaurant run by a good friend. Everywhere in Costa Rica they have great fruit drinks (maracuya, mora, mango). And, of course, the excellent Costa Rican coffee.